These are excerpts from personal support letters to 25 targeted individuals, giving thanks for encouraging words and defining moments. I loved talking to you after church this Sunday and remembering all the history between our families. I think it is incredible that the new generations of our familes are even now growing up together in church. The legacy continues! It is such an honor to work with your oldest son and have him as my friend, pastor, mentor, and true confidant. Likewise, I am blessed to continue a strong relationship with your youngest, a true forever friend. for our safety" while we are in Guatemala. relentless pursuit. And that is the way it should be. widowed mother and her 3 kids. incredible thing that is neither safe, easy, or restful. My goodness! Thank you for your contribution! It is so awesome to have your support. The last time I felt like this around you I was stealing a tree from a room full of floral managers. Seriously, it means the world to have your support. You should grab a few of your Kroger peeps and come down for a week! the home of dear friends. expectations of your continued role in our future. Sunday that you choose. Just let me know. I don't know if I ever told you, but I owe a great deal to you. I was about to quit Kroger… just walk away when you came into my life. I remember you standing there on that balcony in your crisp and impeccable suit. I thought you were from G.O. You gave me hope. I saw you walk away from a promising career to chase your dream. I thought you were nuts. And then I saw you fight through the hard times and never quit. You kept your chin up and fought. Your integrity inspired me then and it does now as well. The two of you gave me a shot 15 years ago with MIB Mortgage. I want you to know that Kellie and I remember and appreciate those days. Even back then I was searching for my mission in life. Now we have found it. In just 97 short days me and the family will jet off on a one-way flight to Guatemala. I am reaching out to all the people who have already touched our lives. Essentially, we are opening a home that will take in 4-6 abandoned infant girls. We will provide them a loving, nurturing environment in our home along with medical treatment and care from a staff of 3 nannies. We will act as adoption agents and place the girls with their forever families. We will also be working in the mountain villages, supporting feeding programs, structure building, clinics, farming projects, and aquaculture. We seek your partnership on a monthly basis. The amount really doesn't matter… the simple fact of having your blessing and support would bolster our faith and help us through lean or difficult times. You are my pastor, and you have become one of my truest friends. You are my mentor, my teacher, and a man who has taught me to live with more grace, forgiveness, and courage. I thank God for you and this congregation that has helped to shape me through my own Plan B.
I wish I would have been a better friend to you after I left for AU. I like to say that I don't have regrets in life, but I truly do regret not always standing by your side. I respect you and the way you live your life, chasing your dreams and standing strong. As you know I am doing the same now, although it took me longer to find my path. Long story short, I really need your support now. I need your friendship, and I need your partnership financially. How do I express the influence you have already had in my life? I think often of our conversations. I think of your time spent in isolation when the monks were away. I think of your Plan B sermon. That takes guts. Getting to know you has been incredible. You are now my pastor and my friend. Thank you for inviting our ragtag group to form a new fellowship with your congregation. The sum truly is greater than the parts. God has authored a Plan B in my life that I could have never imagined. I find myself literally face down and crying tears of thanks every day. I am broken by God and I never want to be mended. Just wanted to take a quick moment tonight to tell you how thankful I am to have you as one of our partners. It is incredible when I think back of meeting you at AU, and all the shared experiences we have had since then. I am honored to call you friend. I am so thankful for your influence on my life. God has grabbed and shattered me (first on a mountain in Guate). I pray that I never fully heal from his reshaping of my life. I want you to know that your support has been affirming to my faith and like cool water to my soul. Having your belief behind us has provided strength during the tough times. I know your life is crazy right now, and I appreciate every conversation we have had… every chance you have taken on our behalf. I am typing a lot of letters and making endless contacts these days, but typing this one brings a big smile to my face. Kellie and I are staring 98 days in the face until we arrive in Guatemala. What an incredible journey we have had since that first week spent with cinder block, biting ants, and falling brick walls. We need partnerships to begin immediately to provide us with a little reserve when we leave to help us through lean months. If your family can contribute a monthly amount of whatever makes your heart sing, it would make a huge impact on what we can do. We pray that you will partner with us and see the great things in store. And… COME TO GUATE and we can continue to grow the lore of Team B.A. We now have this calling on our lives from God to now work with others to connect lost children to families who want to live out this pure religion of accepting children into their homes to complete their families. Our life has been immeasurably enriched by having these two little daughters of ours show us the power of love and faith in action. Likewise, our hearts have been seized by the power of faith of the people in Guatemala. We are making a permanent move and this will be our life work. We believe that we were once lost and become sons and daughters of God by his adopting us and calling us his own. This miracle of adoption compelled us to live out faith in accordance to James 1, believing that Pure and Undefiled religion is meeting the needs of orphans and widows in their distress. I remember your comment 20 years ago when you learned that Kellie and I were dating. You simply said, "oh, that is powerful." At the time I felt embarrassed and unworthy of that statement from you. At that moment I remembered back to the promise that was in your voice years ago and it made me want to fight my way back… I wanted to fight again for my marriage… to love my wife… to provide hope for my children. Something began new in me around that time. 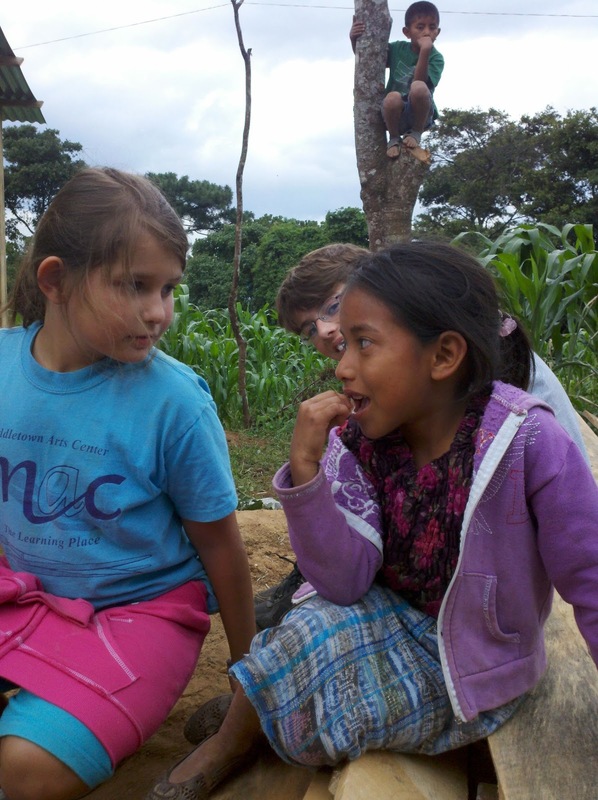 Kellie led me to Guatemala, and God brutally seized my heart. I have never recovered. I never want to recover. This is our mission. How do I even begin to tell you the impact the two of you have on my life? Larry, I am still blown away by your sharing this past Sunday. My life changed that week we stepped onto that plot of land that became the home of Luis. I was a shattered soul with no real expectation of life ever getting any better. I was fully lost. I was just living day to day for the sake of my kids and wife. God grabbed me harshly that week and shook me to my soul. I have never recovered. I never want to recover. I need your help moving forward. For us to follow God's will… we are required to ask our friends and family to support us. This is not an easy thing to ask. I was raised to support myself and my family. But, God is using us to provide chances for many to give to his calling. His calling that we are to love our neighbors… that we are to care for orphans and widows… and yes, even that we are all the least of these. We all have our poverties. God has shown me mine in a way I will never forget. My heart is forever indebted. This below is the attachment to all the above letters. Straight up folks… this is our reality. We do not go to Guate alone… we take you with us. You can be a part of His story. GUATEMALA 2013: (8) Worthy of My Name?